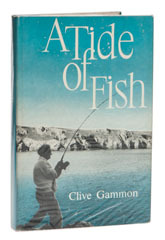 It is hard to credit, but this was Clive’s third book, published after Hook, Line and Spinner and The Fisherman’s Fireside Book and it shows him at the peak of his powers as an angling writer. He had already become a regular contributor to the Angling Times and had started to write a regular column for Creel when this fine book went on sale, but it wasn’t long before the prospect of writing for Sports Illustrated lured him off to America, from where he would not return for another twenty five years. For some reason, A Tide of Fish was published in a ridiculously small edition by Heinemann and so it fetches quite high prices on the second hand market, twice or even three times the price that his earlier books fetch. The chapters deal with entirely with the fishing on the Gower and Castlemartin peninsulas in West Wales and Camarthen bay that lies between them. The hundred and sixty seven pages contain some of the finest writing on British sea fishing ever penned, making the author worthy of mention in the same breath as Aflalo and it is one of those books that gives you the wish to fish, even if most of it is about beach casting on cold, wild nights, a subject that normally makes me want to huddle closer to the fire. Typically, there is very little technical detail, most of the book being taken up with descriptions of places, people and the fierce call the sea had on Clive in those days, and still has for all I know. Well worth reading if you can lay hands on a copy.